히롤라(hirola, 학명: Beatragus hunteri)는 우제목/경우제목 소과에 속하는 영양의 일종이다. 케냐와 소말리아 사이의 국경 지역에서 발견되며, 멸종 위급종으로 분류하고 있다. 1888년 동물학자 헌터(H.C.V. Hunter)가 처음 기술했다. 히롤라속(Beatragus)의 유일종이다. 전 세계 개체수를 300-500여 마리로 추정하고 있으며, 사육 상태의 히롤라는 없고 야생에서의 개체수는 지속적으로 감소 추세에 있다. 국제 자연 보전 연맹의 IUCN 적색 목록은 이러한 감소 상태가 지속될 경우, 히롤라속은 근대 이후 인류 역사상 아프리카 대륙에서 멸종한 최초의 포유류 속이 될 것이라고 밝혔다. ↑ “Beatragus hunteri”. 《멸종 위기 종의 IUCN 적색 목록. 2008판》 (영어). 국제 자연 보전 연맹. 2008. 2009년 4월 5일에 확인함. Database entry includes a brief justification of why this species is of critically endangered. ↑ Sclater, P. L. (1889) Description of Hunter's antelope. Proceedings of the Zoological Society 1889, 372–377. ↑ “보관 된 사본”. 2013년 10월 29일에 원본 문서에서 보존된 문서. 2015년 10월 23일에 확인함. ↑ Grubb, P. (2005). 〈Order Artiodactyla〉 [소목]. Wilson, D.E. ; Reeder, D.M. 《Mammal Species of the World: A Taxonomic and Geographic Reference》 (영어) 3판. 존스 홉킨스 대학교 출판사. 675쪽. ISBN 978-0-8018-8221-0. OCLC 62265494. ↑ PROBERT, J. 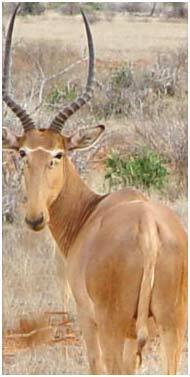 (2011) The Tsavo hirola: current status and future management. MSc thesis. Imperial College London, UK. ↑ King, J., Craig, I., Andanje, S. and Musyoki, C. (2011) They Came, They Saw, They Counted, SWARA, 34: (2). ↑ James Probert, Ben Evans, Sam Andanje, Richard Kock and Rajan Amin. Population and habitat assessment of the Critically Endangered hirola Beatragus hunteri in Tsavo East National Park, Kenya . Oryx, available on CJO2014. doi:10.1017/S0030605313000902. 이 문서는 2019년 4월 7일 (일) 13:34에 마지막으로 편집되었습니다.